The V-C310B-HDSDI block camera is perfect camera for all your multimedia broadcasting needs this camera features Optical 10X zoom installed, A variety of resolutions supported (1920X1080 30P/60i, 1280X720 60p), HD-SDI SMPTE 292M standard, Video transmission up to 100M (5C-HFBT coaxial cable), Data control by RS-232 and Easy coaxial cable installation. 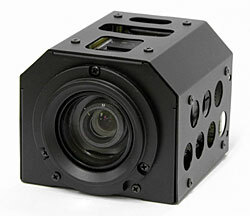 The V-C310B-HDSDI Block camera is a full HD production Block Camera module that can be mounted in the tightest spaces. Flexible HDMI and HD-SDI outputs provide a choice of video formats. The unit's small enclosure and wireless remote, combined with instant auto-focus and fast accurate zoom allow for extremely flexible POV camera placement. The V-C310B-HDSDI requires only a 12VDC supply and consumes less than 3.6 watts of power. Low light sensitivity along with wide dynamic range increases the possible uses for this versatile camera module. S/N ratio 50 dB or more Weight 8.5 oz. Shutter Speed 1/2 to 1/10,000 sec Dimensions 2.2" x 2" x 2.5"